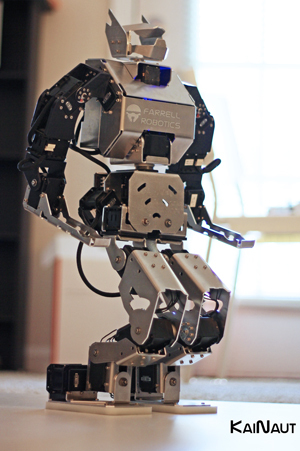 Hey all, just throwing up a picture and video of our new Farrell Robotics humanoid model for RG 2012. All questions and comments welcome! The robot os very impressive. Can you take a closeup picture of the ankle\foot ? Unfortunately, we don't have the two big robots together and won't until RoboGames. On the plus side, that's coming right up! (Just to make sure you know, this image and the one above are just thumbnail links to higher resolution pictures - so you can zoom in and see the ankle better up there too). Also, the ankle pictures there are of the right and left foot respectively, the one of the left is the outside of the foot, and the one on the right in the inside (servo horns face in). Just so that you won't have it too easy, I've invited a few of my friends to RoboGames to give KaiNaut and ZynNaut a run for their money. I'm quite excited to be competing with them this year! Also the prospect of fighting other big robots is always fun - my wife is pretty decent at piloting all of our robots at this point, we just don't have any two the same size. I presume Zaura will be in the MW fighting, will King Kizer as well - or is he just going to be on tour? Looking forward to seeing you in a day or two Lem! hivemind wrote: I'm quite excited to be competing with them this year! Also the prospect of fighting other big robots is always fun - my wife is pretty decent at piloting all of our robots at this point, we just don't have any two the same size. I presume Zaura will be in the MW fighting, will King Kizer as well - or is he just going to be on tour? King Kizer and Toko Toko Maru were originally planning just to do demos... but we convinced them that you would be totally disappointed not to have the chance to battle with them in the ring. So, they're planning to fight.